Does Penguin really discount all links, when it sees too many low quality links detected for a site? This was reported via tweets from Pubcon last week, but Google has clarified this and confirms Penguin does not discount all links. At Pubcon last week, Gary Illyes made a statement about links, implying that Penguin could discount all links to a site, when too many low quality links were detected. However, Illyes confirms that he was referring to links and manual actions, not Penguin, in a statement to The SEM Post. 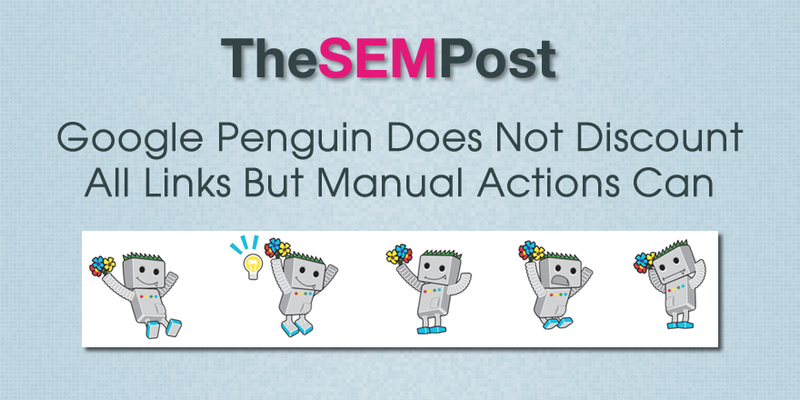 When speaking yesterday, a statement I made about manual actions was phrased in a way that sounded like I was talking about Penguin — that was incorrect and I apologize for the confusion. What I was trying to get across is that, when there are clear signs of search manipulation, manual actions may be used to discredit links. When it comes to link related manual actions, the statement that manual actions can discount all links – including the good and the bad – is not very surprising. But news that the same possibly applied to Penguin was surprising, since there has not been reports of devastating Penguin drops like we have seen with previous Penguin releases – something that discounting all links would have done. Hopefully this clarification from Illyes and Google will clear it up – Penguin does not discount good and bad links when a large number of bad links are found, but manual actions do… yet another reason site owners should leave their disavows in place.